Presented by IM-PORT//EX-PORT, a platform for exchange in art, architecture, and science on board of ship in Kassel, Germany, August 7, 2012, 9:30 PM until midnight. The land has largely been colonized, but the sea is free! The waters claimed by the states are designated as “territorial waters,” comprised of inland waterways and reservoirs, as well as a variable number of miles of so-called “territorial sea” offshore. 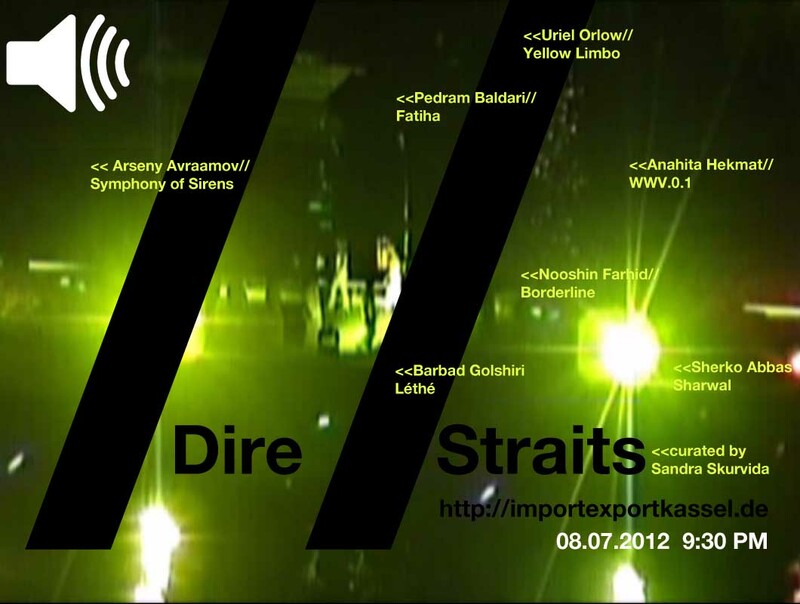 These often-contested latitudes and their sociopolitical undercurrents are explored in the transnational video program entitled Dire Straits as part of the ongoing series on exchanges under embargo; featuring sound works by Arseny Avramov, Symphony of Sirens, 1922 (recording by Leopoldo Amigo and Miguel Molina, 2003) and Barbad Golshiri, Léthé; and videos by Sherko Abbas, Pedram Baldari, Nooshin Farhid, Anahita Hekmat, and Uriel Orlow.